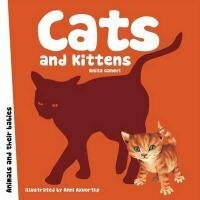 This is one of the titles in the ‘Animal Families’ series of large format board books on animal life cycles for young children. I found it helpful to read and look at the book through a young child’s eyes rather than from the perspective of an adult reviewer. The pictures of the cats and kittens are unsophisticated but Rafael, just coming up to three years, liked them and talked about what was happening on each page. The image of the kitten having ‘an injection to stop it getting ill’ seemed particularly fascinating. The print is beautifully clear and is sometime arranged on the page in interesting ways: when the kitten climbs a tree the print gets higher and higher too. Colours are bright and the book is full of movement and kitten-like playfulness. So this is a good choice for reading aloud to one young child or to a group in a nursery class.